Philosophical Investigations (Philosophische Untersuchungen) is, along with the Tractatus Logico-Philosophicus, one of the two most influential works by the 20th-century philosopher Ludwig Wittgenstein. In it, Wittgenstein discusses numerous problems and puzzles in the fields of semantics, logic, philosophy of mathematics, and the philosophy of mind. Oxford: Basil Blackwell, 1953. First edition. Hardcover. Very near Fine/Near Fine. 232 pp. Edited by Rush Rhees, and G. E. M. Anscombe. Translated by G. E. M. Anscombe (original German text on the versos, English translation on the rectos). Errata slip laid in. Price of 37s 6d. on the front flap of the dust jacket. First printing of the first edition. 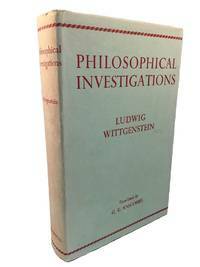 Philosophical Investigations is the first of Wittgenstein's posthumous works to be published, and is one of his two monumental philosophical works (the other being Tractatus Logico-Philosophicus). The influence and impact that this book has had on philosophy cannot be overstated. Thousands of books and journal articles have been published on Philosophical Investigations and the ideas and arguments therein in the decades since its publication, and it continues to be viewed as one of the cornerstone philosophical works of the 20th century. A very attractive copy of arguably the most important book by one of the most brilliant and influential philosophers of the twentieth century. Very near Fine book in a Near Fine dust jacket with mild age darkening to the spine panel and a few hints of wear to the extremities. Oxford:: Basil Blackwell,, 1953. Second edition, 1958. G/no DJ. 1953 Blackwell 2nd edition has blue boards, no dust jacket. Original owner's name on front paste-down endpaper, bookdealer's sticker. Slight abrasions to edges of boards, otherwise book tight and intact. Text in German and English. Translated by G.E.M. Anscombe with minor corrections to the German text in this second editon and more changes to the English text. Second edition, 1958. 1991-08-07. New. Ships with Tracking Number! INTERNATIONAL WORLDWIDE Shipping available. Buy with confidence, excellent customer service! 2005-05-04. New. Ships with Tracking Number! INTERNATIONAL WORLDWIDE Shipping available. Buy with confidence, excellent customer service! 1973-01-01. New. Ships with Tracking Number! INTERNATIONAL WORLDWIDE Shipping available. Buy with confidence, excellent customer service! Basil Blackwell. PAPERBACK. 0631146709 New Condition. . New. Basil Blackwell. PAPERBACK. 0631146709 Like New Condition. . Fine. Prentice Hall. Hardcover. 0024288004 Like New Condition. . Fine. Prentice Hall. Hardcover. 0024288004 New Condition. . New. Philosophical Investigations; The English Text of the Third Edition. 2006-03-01. Good. Ships with Tracking Number! INTERNATIONAL WORLDWIDE Shipping available. May not contain Access Codes or Supplements. May be ex-library. Shipping & Handling by region. Buy with confidence, excellent customer service! Oxford: Basil Blackwell, 1958. German and English text on facing pages. Pages are in very good, clean condition; edges and endpapers a little yellowed. Blue hardcovers with gilt titles on the spine. Corners lightly bumped. Grey DJ with red titles. Spine and edges darkened. Small tears and chips on the corners and edges. Not price clipped. VG/VG-. 2nd Edition. Hardcover. VG/VG-. Wiley-Blackwell (an imprint of. PAPERBACK. 1405159294 Brand new book.Buy with confidence. Money Back Guarantee.Expedite Shipping Available. International shipment available. . New. New York: The Macmillan Co,, 1957. Very Good, lacking the dust jacket, small prior owner name stamp copyright page, light wear to cloth at spine ends, contents clean, tight, and unmarked. Second Printing, 1957 stated copyright page, parallel German text and English translation. translated by G.E.M. Anscombe. Wittgenstein's most important work, and considered one of the most important philosophical works of the twentieth century. . Second Printing. Cloth. Very Good/No Jacket. 8vo - over 7¾" - 9¾" tall. Oxford: Basil Blackwell (1958), 1963. 2nd Edition 2nd Printing. Blue Cloth, Gilt. Near Fine/Very Good. X, 232 Pp In English, With Another X, 232 Also In German. Stated Second Printing (1963) Of Second Edition (1958), With Some Changes From The First Edition (1953); The Anscombe Translations Of Wittgenstein Improve Slowly But Dramatically Over The Decades As Wwi Recedes Into The Distance. Slight Rubbing At Corners, No Names Or Marks. Dj Lightly Used, Spine And Edges Browning But Still Greenish, Price Clipped, Slight Soiling From Usage. Pearson. PAPERBACK. 0024288101 Special order direct from the distributor . New. Prentice Hall, 1968-02. Hardcover. Good. Prentice Hall. Hardcover. 0024288004 minor staining to top page edge - no dust jacket (as issued?) - otherwise a fine clean like new copy - enjoy . Very Good. Wiley-Blackwell, 1998-03-16. 4. Paperback. Used:Good. Pearson. PAPERBACK. 0024288101 BRAND NEW W/FAST SHIPPING! This item is: Philosophical Investigations, 3rd Ed., 1973, by Wittgenstein, Ludwig; FORMAT: Paperback; ISBN: 9780024288103. Choose Expedited for fastest shipping! Our 98%+ rating proves our commitment! We cannot ship to PO Boxes/APO address. To avoid ordering the wrong item, please check your item's ISBN number! . New. 2004-09-01. Good. Ships with Tracking Number! INTERNATIONAL WORLDWIDE Shipping available. May not contain Access Codes or Supplements. May be ex-library. Shipping & Handling by region. Buy with confidence, excellent customer service! WILEY-BLACKWELL: BASIL BLACKWELL. FINE IN FINE DUST JACKET. PUB 2009. 1ST THUS. HARDCOVER. REVISED 4TH EDITION BY P.M.S. HACKER & JOACHIM SCHULTE / BILINGUAL EDITION TRANSLATED BY G.E.M. ANSCOMBE, HACKER, SCHULTE . BOOK IS FINE WITHOUT ANY MARKS TO THE BINDING OR THE TEXT. D.J. IS FINE AND IS NOT PRICE-CLIPPED. A BEAUTIFUL CLEAN, BRIGHT, UNFADED COPY WITH NO REMAINDER MARK. .
NEW YORK NY: MACMILLAN CO (THE). FINE WITHOUT D.J.. PUB 1968. THIRD EDITION. HARDCOVER. PARALLEL ENGLISH/GERMAN TEXTS WITH EACH 232 SEPARATELY NUMERED (TOTAL PAGES 464) TRANSLATED BY G.E.M. ANSCOMBE . GREEN CLOTH COVERED BOARDS WITH GILT TITLES TO THE SPINE AND UPPER COVER. BOOK IS FINE WITHOUT ANY MARKS TO THE BINDING OR THE TEXT. AN EXCELLENT CLEAN AND TIGHT COPY OF THIS HIGH SPOT OF 20TH CENTURY PHILOSOPHY THAT FINALLY, AFTER 15 YEARS SINCE ORIGINAL 1953 EDITION, INCLUDES INDEXES IN THIS THIRD EDITION. .
Wiley-Blackwell. Hardcover. 1405159286 BRAND-NEW, Unread Copy in Perfect Condition. FAST UPS shipping (you'll receive your order within 1-5 business days after shipping in most cases*), this helps to ensure your order arrives in perfect condition. PLEASE NOTE: FedEx does not generally deliver to PO Boxes or APO addresses, so please be sure to give us a physical street address to deliver to; also, unfortunately, we cannot ship this item to Alaska or Hawaii. THANKS! *(this applies to domestic shipments within the continental US - other destinations may take longer) . New. Wiley-Blackwell, 2009. Hardcover. New. 8.9 x 6.1 cm. 2009-06-09. Good. Ships with Tracking Number! INTERNATIONAL WORLDWIDE Shipping available. May not contain Access Codes or Supplements. May be ex-library. Shipping & Handling by region. Buy with confidence, excellent customer service! Oxford: Basil Blackwell, 1968. Third edition. Hardcover. Near Very Good/Very Good. 272 pp. Price sticker of £3.00 on front flap of jacket. Bound in black cloth with a tan dustwrapper. Translated by G.E.M. Anscombe. A near Very Good book with considerable foxing to the textblock and to the title page with moderately warped boards in a Very Good jacket with a few traces of edge wear and a tiny spot of discoloration to the front panel. OXFORD: BASIL BLACKWELL. VERY GOOD WITHOUT D.J.. PUB 1958. SECOND EDITION. HARDCOVER. ISBN: THIS IS THE 1963 ENGLISH ONLY REPRINT TRANSLATED BY G. E. M. ANSCOMBE. Keywords: PHILOSOPHY. 1991-08-07. Good. Ships with Tracking Number! INTERNATIONAL WORLDWIDE Shipping available. May not contain Access Codes or Supplements. May be ex-library. Shipping & Handling by region. Buy with confidence, excellent customer service! 2009-03-02. Good. Ships with Tracking Number! INTERNATIONAL WORLDWIDE Shipping available. May not contain Access Codes or Supplements. May be ex-library. Shipping & Handling by region. Buy with confidence, excellent customer service! Pearson. PAPERBACK. 0024288101 1968 Macmillan hard cover - 3rd edition 1st printing - German & English - Anscombe translation - no dust jacket - minor staining to closed page edge - otherwise cover fine binding strong contents clean - enjoy . Very Good. Wiley-Blackwell. Hardcover. 1405159286 New Condition *** Right Off the Shelf | Ships within 2 Business Days ~~~ Customer Service Is Our Top Priority! - Thank you for LOOKING :-) . New. Great Britain: Basil Blackwell, 1968. Hard Cover. Very Good/No Jacket. A clean, unmarked copy with a tight binding. Cover a bit worn. Previous owner's name inside. Wiley-Blackwell (an imprint of, 2009-01-01. Paperback. Good. Wiley-Blackwell. Hardcover. 1405159286 Special order direct from the distributor . New. Wiley-Blackwell. PAPERBACK. 0631205691 New Condition. . New. Wiley-Blackwell. PAPERBACK. 0631205691 Like New Condition. . Fine.